“There is not one unified approach to Africa. You always have to keep in mind the fact that we’re talking about 54 separate countries and you need to take into account their true needs, and not try to impose your own” says Olivier Chaduteau, Managing Partner of Day One and director of this study. For detailed information or if you wish to order this study, contact us at contact@dayone-consulting.com. 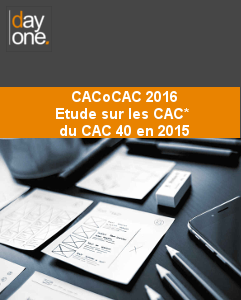 This French survey is the annual analysis of the statutory auditors of the French 40 most significant values of the 100 highest market caps on the Euronext Paris (CAC 40). It includes, among others things, analyses of fee evolution, market shares and appointment terms. In order to map the market of legal startups, we studied and analyzed the activity of 140 startups in 12 countries on 4 continents for a period of 8 months. Our analysis sought to identify the different segments of the legal market that will be impacted by the use of technology. To this end, we analyzed a broad and representative sample, allowing us to grasp how the market works and to analyze future trends. This study, conducted with Bruno Deffains, a professor of economics at the Sorbonne and the Institut Universitaire de France, aims to compute the economic weight of the legal industry in France. It concludes that the legal industry represents more than 24 billion euros and employs some 243,000 people. This French study explores the wide range of possibilities opened by Legal Process Outsourcing. In it, we analyzed to what extent legal services can be outsourced. This survey includes both bibliographic sources as well as interviews with market actors. With more than 20 general counsels of large companies and about 10 managing partners of law firms, this survey focuses on the main challenges faced by law firms when serving their clients. Conducted in cooperation with DAF Magazine, this study analyzes the relationship between CFOs and their financial advisors (accountants, statutory auditors, financial consultants). Published in the LJA magazine, this study looks at the impacts of new developments driven by Generation Y – developments which could greatly impact law firms’ business models. If taken too lightly, there could be serious consequences for firms that are unwilling to change. For detailed information click here (French link) or contact us at contact@dayone-consulting.com.